Zenescope Entertainment’s Grimm Fairy Tales adds horror and suspense to our beloved classic fairy tales. Each issue has two parts. The first part is the framework of the story. Sela Mathers has a special ability that she uses to teach life lessons to those who need it. Those that ignore the lessons suffer consequences. The second part of the story is ALWAYS a twisted version of a classic fairy tale, and the fairy tales are usually violent. The tales are warning the readers to change their ways or suffer. I’ve read the first three volumes, a total of 18 stories. Here is my review of issue #7, Snow White. The story begins with a young girl, Stephanie, who has been ill for a few months. Her step-mother, Terry, appears to be the perfect stepmother. She even tells Stephanie to call her “mom.” When Stephanie asked Terry if she thought she’d return to cheerleading, Terry revealed that she was a cheerleader captain just as Stephanie had been before she became ill. She also told Stephanie she missed being the center of attention, young and full of life. Terry goes back to preparing lunch for Stephanie, which included poisoning her food. Sela shows up at the doorstep and hands Terry the book of fairy tales, suggesting she read Snow White. So Terry reads the twisted fairy tale. We all know the story of Snow White so I’ll skip to the twisted part. The dwarves feed on human flesh that has dark souls. They couldn’t eat Snow White because of her innocence. While the dwarves were out, the queen appeared at the doorstep and gave Snow White a basket of fruit laced with poison. She ate one of the apples and fell to the floor. The dwarves returned to find a dead Snow White. Back home, the queen looked into her mirror and asked who was the most beautiful in all the land. Suddenly all seven dwarves appeared and ate her alive. Terry didn’t think twice about the story after she finished reading it. She heard a noise in the basement and went to investigate. In the basement was a mirror. She looked into the mirror and the seven dwarves appeared and ate her alive, like the queen. The story ended with Terry in a straight jacket at an asylum. Joe Brusha and Ralph Tedesco does an excellent job at writing the stories. Anthony Spay does a superb job with the artwork. The characters are well detailed, especially their facial expressions. All the issues have provocative covers. But there’s nothing provocative or explicit about the stories on the inside. 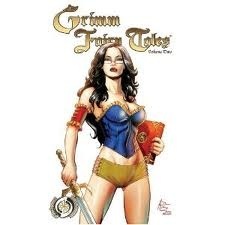 Grimm Fairy Tales is a remarkable piece of work. The stories told, and the lessons they provide, are worth the read. Artwork is great. If you’re a horror fan, then you’ll definitely love these classic tales with its’ horrifying twists. I’m sticking with this horror comic, and I plan to read until I’m caught up with the current issue.